Packard Bell is a technology company which used to make computers, as well as TV's, and radios. Packard Bell was founded in 1926 and lasted until 2008 when Packard Bell was acquired by the Acer computer corporation. Packard Bell played a moderate role in vintage computing and were the manufacturers of many computers. Here is a listing of models with their CPU I have compiled over the years. 2008 seems pretty late. I know Acer ended up purchasing thier IP but werent they purchased prior to that as well. i remember in thier hayday being sold at sears (late 80's early 90's) but I dont have any memories of seeing them in the late 90's or early 2000's let alone 2008. Seems they were gone before then. Apparently, there is a new US Packard Bell producing laptops for J.C. Penney starting last year but I haven't seen any. Huh. Interesting to hear something about that. 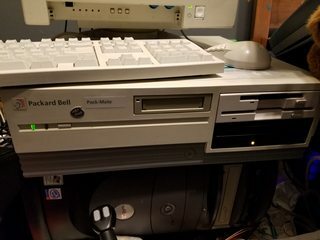 I got my Packard Bell with the keyboard and mouse for $17 + tax last February of 2017 and upgraded the heck out of it. In fact, Amazon does sell Packard Bell laptops that are running Windows 10, but, they ain't what they used to be. In fact, back in the 1980's, they were the first company that are IBM PC Compatible that were sold at retail stores, such as Sears for the time being until the 1990's when they got bought out by NEC, then later Acer. Wow, one failing company selling another failing companies product. Thats just silly. At this stage, it's just a name, like "Hell and Bowels" (bankrupt in 2011) or "Rolapoid" (bankrupt twice in the 2000s and now owned by Polish investor Oskar Smołokowski). The old PB was notable not only in home appliances, but also in early computing. I'd posit that the PB250 (no relation to the PB500 or its ilk) was one of the first minicomputers. You could power it from a wall receptacle. In the 80s, the moribund brand was picked up by an Israeli army tank driver and his buddies.